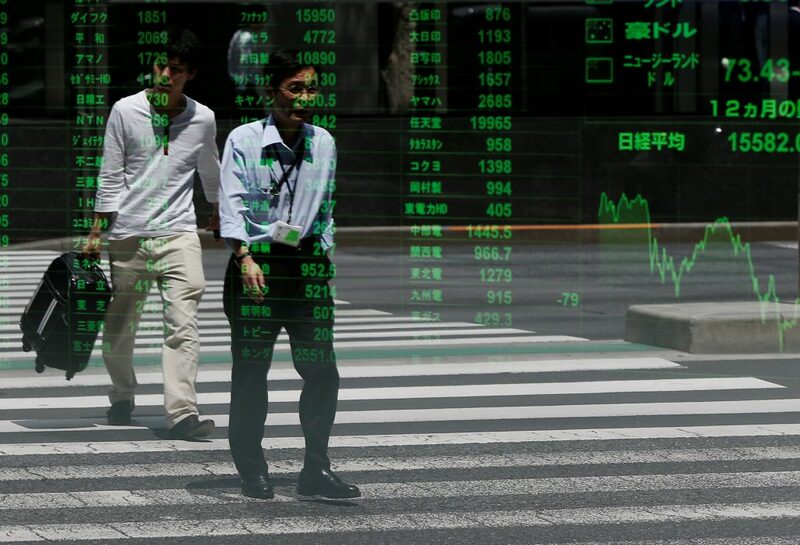 Asian stocks enjoyed a relief rally on Monday as upbeat U.S. jobs data soothed immediate concerns about the health of the world’s largest economy, while the prospect of more policy stimulus helped keep sovereign yields near record lows. MSCI’s broadest index of Asia-Pacific shares outside Japan jumped 1.9 percent to a one-month top. Australia added 1.8 percent and Shanghai 1.1 percent. Stocks in Germany were seen starting 0.9 percent higher, with the CAC up 0.7 pct and the FTSE 0.5 percent. EMINI futures for the S&P 500 came within a point of their all-time top. Japan’s Nikkei climbed 4.5 percent, its biggest daily gain in three months, as Prime Minister Shinzo Abe flagged a fresh fiscal stimulus package after the ruling coalition won a landslide victory in the upper house. “Abe’s victory boosted confidence in investor sentiment, and winning a two-thirds majority sends foreign investors a message that Abe’s policies will see a progress,” said Hikaru Sato, a senior technical analyst at Daiwa Securities. The Asian rebound came after news that the U.S. economy added 287,000 jobs last month, well above median forecasts and recovering from a very weak May report. In the end, investors concluded the data was not strong enough to revive the prospect of a rate hike from the Federal Reserve for the next few months, benefiting bonds and stocks. The Dow gained 1.4 percent, while the S&P 500 firmed 1.53 percent and the Nasdaq 1.64 percent. The rise set the seal on an eight-session run that has seen U.S. equities add $1.4 trillion to market capitalization. Several Fed officials are scheduled to speak this week, offering plenty of opportunities for the market to glean clues about policy. The Bank of England meets on Thursday and might well cut its 0.5 percent interest rate to offset the economic drag from Britain’s vote to leave the European Union. Governor Mark Carney has already opened the door to easing, including the expansion of its 375 billion-pound bond-buying program. The only question was timing, with analysts in a Reuters poll divided on whether a cut would come this week or in August. Various reports out Monday argued for urgent action, with consumer spending falling last month, the business outlook darkening by the most in four years, and economic activity in London slowing sharply. “The outcome of the U.K. referendum has dealt a significant shock to the outlook for the global economy,” warned Christian Keller, an economist at Barclays. That was one factor behind the relentless demand for sovereign debt that has driven down yields, which move inversely to prices, and kept the pound at its weakest since 1985. Benchmark U.S. 10-year paper was paying 1.37 percent, with Japan at -0.28 percent and Germany -0.20 percent. Sterling was stuck at $1.2963 on Monday, having failed utterly to rebound from the 13 percent loss suffered in the immediate wake of Brexit. The Japanese yen eased as the Nikkei rose to reach 101.35 per dollar, while the euro stayed on the defensive at $1.1049 having touched a low of $1.1003 on Friday. In commodity markets, spot gold was steady around $1,364.80 per ounce. Crude prices edged down to near two-month lows on seasonally weak consumption, despite comments from Saudi Arabia’s oil minister that the oil market was becoming more balanced. Brent crude was down 16 cents at $46.60 a barrel, while NYMEX crude fell 23 cents to $45.18.